UPDATE: Chadwick’s car has been found! See that sweet red drag-prepped 1967 Mustang up top? That belongs to 68-year-old Mike Chadwick. It’s his pride and joy. But sadly, it’s no longer in his possession, thanks to some BMW-driving thieves who reportedly stole it from right in from of his San Ramon, Calif. home on Tuesday. According to the San Jose Mercury News and Dragzine, the Mustang — along with Chadwick’s truck and the trailer containing the car — were taken from after he spent Labor Day weekend competing at Sonoma Raceway. The rig was parked at his house because his normal storage facility was closed. Chadwick, naturally, is said to be heartbroken by the news. 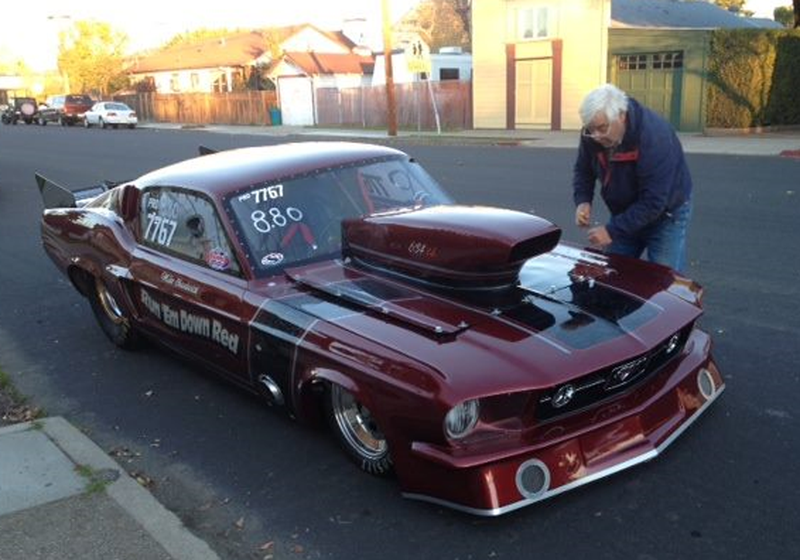 He had owned the Mustang since the late 1990s and estimates he has spent more than $100,000 building it. It was no stranger to awards, winning Best Competition Car at the Sacramento Autorama in 2012. What kind of person would take this man’s dream away from him? We don’t know, but we do what they were driving: a silver BMW 7 Series, which was photographed by a neighbor. The newspaper reports the Ford truck its and trailer have California license, with the truck being is 6H42545 and the trailer being 4BD6775. As for the Mustang, well, that’s not hard to spot. Anyone with information about the case is asked to call the San Ramon Police Department at (925) 973-2700. If you’re out in the area, keep your eyes out, and spread the word about Chadwick’s car. With any luck he’ll be reunited with it soon. Update: Here are more photos of Chadwick’s Mustang on Flickr. It’s a gorgeous machine, let’s hope he gets it back.